Mayhew Steel Products, Inc. expanded their CatsPaw product line with the addition of five new mirror inspection tools. The mirrored heads, ranging from 1-1/4 in. to 3-1/4 in. diameter, allow operators to view or magnify into hard-to-reach-areas. All are designed with either double or all-angle ball joints that not only hold the mirror in place, but enable the operator to adjust it to any angle for best viewing. 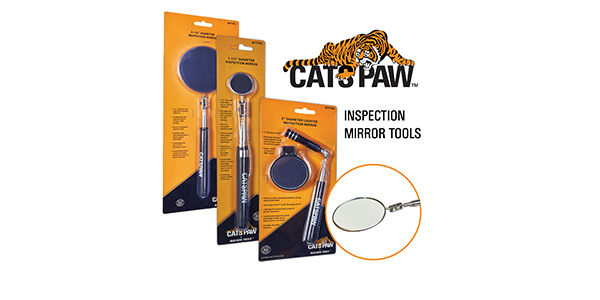 Used for everyday auto inspection applications, each of the tools has a clear glass mirror for perfect reflection and a stainless steel, lightweight telescoping handle. The telescopic reach, ranging from 8 in. 37-1/2 in., varies for each tool. Each tool is backed by a two-year select warranty. 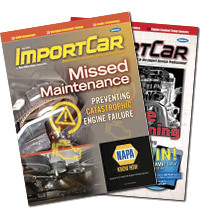 The 1-1/4 in., 2-3/16 in. and 3-1/4 in. diameter inspection mirror tools feature a textured cushion to secure grip in wet or dry conditions and their pocket clip (featured on the two smaller diameter tools) keeps the tool secure and easily accessible. The mirrors are encased in stainless steel. The LED lighted inspection mirror tools, available in 2 in. or 3 in. diameter, illuminate dark areas for optimum inspection. The mirrors are encased in ABS holder and batteries are included. For additional information, visit Mayhew Tools.